Hair Salon Columbia Md / Vivid Salon Columbia – How Summer Weather Affects Your Hair | Best Salon and Spa in Columbia MD! In winter, your hair was screaming for moisture. Now it’s limp as a dishrag! Needless to say, the weather has a tremendous influence on your hair. Summer means more time outdoors. That means more exposure to heat and humidity. Naturally straight hair will collapse curls, while flat ironed naturally curly hair will revert to its original state…plus frizz. Here’s something you may not have understood about moisture and hair. You actually need moisture to combat and balance out humidity. The trick is not to have the moisture level greater than the moisture in your hair. If it is, your hair will “reach out” toward it, creating frizz. And then, of course, there’s sun damage to contend with. What can you do? Relax. We have a plan. Clarify regularly. In the summer, the hair’s cuticle is more likely to absorb everything around it. That’s why clarifying is so important. It removes product build up and moisture. Color Proof Clear it up is an excellent clarifier. Talk to your stylist about how often you should use it on your locks. Use a gentle shampoo. Put aside winter’s heavier cleansers. You don’t need the additional moisture now. Your stylist is familiar with your hair type and texture. She can recommend a lighter weight summer shampoo. 3. Use lighter hair serums. In the winter it was all about heavier crèmes for your tresses. Now it’s time to lighten up. 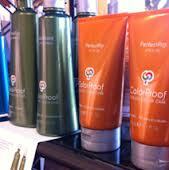 Color Proof Heat Proof is an excellent example of a styling product that’s great for summertime use. Again, your stylist can be more specific with you. 4. Deep condition weekly. We actually recommend this year round! Deep conditioning penetrates dry, chlorine or sea salt damaged hair for more shine, bounce and styling manageability. We recommend Color Proof Deep Quench for fabulous results! And, of course, get regular trims for healthy, happy hair. Got other questions? Just let us know. We’re happy to help! If you want to your hair look soft and shiny, it’s what we do best at Vivid Salon located in Columbia Md. !